Facebook is the most popular social network in the world. Many of our students spend hours on it every day. But have you ever given them a chance to speak about Facebook in an English lesson? In this post I would like to bridge this gap and give you a chance to teach some words connected with Facebook. Once the students know the words they will be able to talk about Facebook and what they do there. To teach the vocabulary, there is an infographic, a quiz and several speaking activities. Go through the following infographic with your students and ask them to translate the words if you teach a monolingual group. In the following quiz your students can practise the vocabulary taught in the infographic. The quiz consists of two parts. It is in HTML5 and it will play on mobile devices and desktop computers. The following section contains several speaking activities to give your students a chance to practise the new words in a meaningful way. The first activity works very well with students who are 15 or older. Hand out the following questions and ask your students to choose three questions they would like to ask you. a) What was the last post you put on your timeline? b) Do you share your photos on Facebook? c) What was your last comment? d) How often do you comment? e) How often do you write a status on your timeline? f) What was the last post you liked? g) How many friends do you have on Facebook? Do you know your friends personally? h) Do you ever message anyone? How often and why? i) What is in your cover photo? j) What was the last thing you shared on Facebook? How often do you share things? k) Do you use news feed or any apps on Facebook? l) Are you a member of any groups? Why? Answer the questions as best as you can and demonstrate the way you would like your students to discuss the questions. Then ask your students to choose 7 questions they would like to ask their partner. Ask them to work in pairs and discuss the questions. The second speaking activity is called ranking. 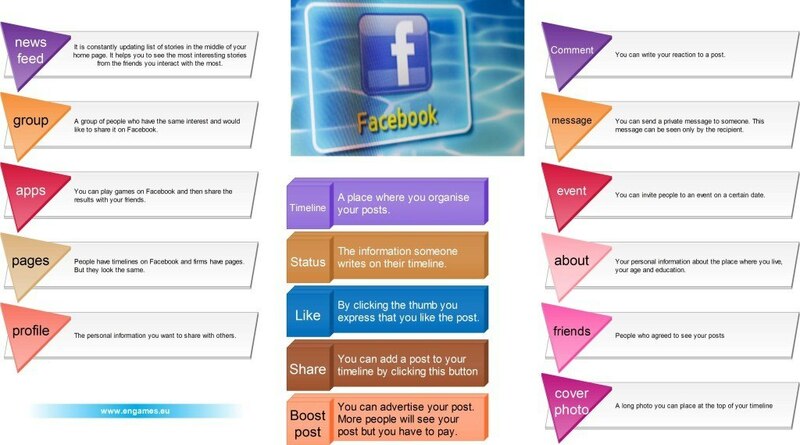 The students should rank the following Facebook features from the most useful and interesting to the least. If you have never done a ranking activity with your students before, it is a good idea to teach the phrases first. Teach phrases like: “I think …. is the most useful…,” “I think …. is the least useful …,” etc. If your students are not able to use these phrases, their discussion will not be very interesting or long.